Kapalua, which means “arms embracing the sea,” is one of Maui’s most luxurious resort areas. It is located on the north western coast of the island at the base of the lush green Kahalawai Mountains. Kapalua’s famous shoreline includes five bays and three of America’s best white-sand beaches. Kapalua’s location is in close proximity to Honolua Bay, Ka’anapali Beach, and Lahaina which are home to some of Hawai’i’s finest resorts. Not only does Kapalua provide access to all of western Maui’s treasures, but it’s also home to two of Hawaii’s best golf courses. The Plantation Course, which holds the PGA Tour’s Hyundai Tournament of Champions in January, and the Royal Kaanapali Course designed by Robert Trent Jones. If you’re more the adventurer type, kayaking and snorkeling are available offering views of Maui’s incredible coral reef system which is home to hundreds of species of tropical marine life. Maui’s Kahalawai Mountains present beautiful hiking trails that capture breathtaking views of Kapalua’s lush green countryside and amazing shoreline. 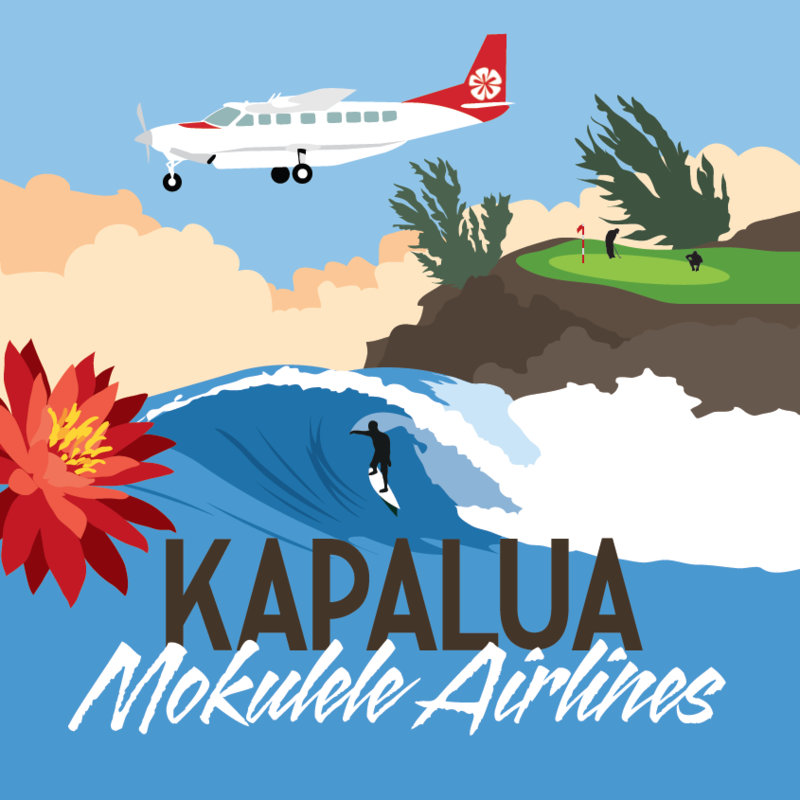 Mokulele Airlines is proud to offer Air Tours out of Kapalua Airport. To learn more about tours click here. https://www.mokuleleairlines.com/air-tours/ With Mokulele you have the opportunity to fly from Kapalua to the Kilauea Volcano on the Big Island, around Haleakala, Hana, and so much more. 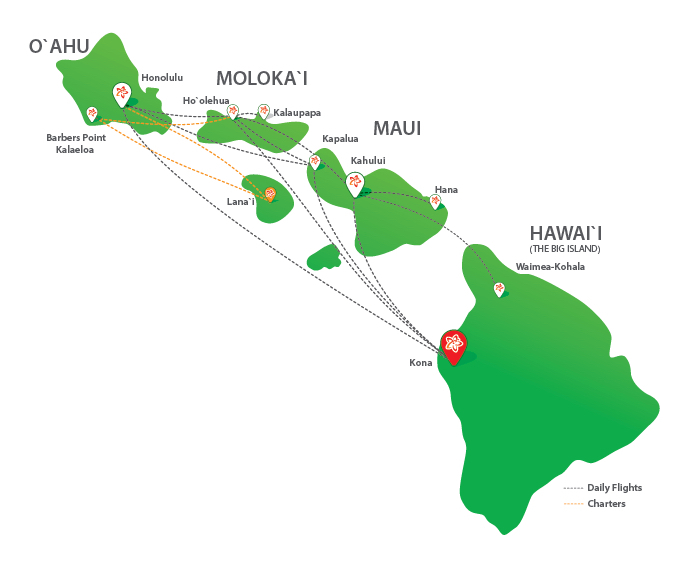 We invite you to learn why Mokulele is Hawaii's Favorite Island Hopper. If you are enjoying your time exclusively in Kapalua, Mokulele invites you to experience all the best of Kapalua. Not only does Kapalua provide access to all of western Maui’s treasures, but it’s also home to two of Hawaii’s best golf courses. The Plantation Course, which holds the PGA Tour’s Hyundai Tournament of Champions in January, and the Royal Kaanapali Course designed by Robert Trent Jones. If you’re more the adventurer type, kayaking and snorkeling are available offering views of Maui’s incredible coral reef system which is home to hundreds of species of tropical marine life. Maui’s Kahalawai Mountains present beautiful hiking trails that capture breathtaking views of Kapalua’s lush green countryside and amazing shoreline. The Royal Lahaina Resort enjoys a world-class location on Maui, which for two decades has been honored by Conde Nast Traveler as one of the "Best Islands in the World." The resort is set on 27 acres of tropical gardens fronting the best and most exclusive stretch of Kaanapali Beach, which has been voted "America's Best Beach" and is consistently rated as one of the most beautiful beaches in the world. Renowned for its traditional Hawaiian ambiance and welcoming service, the Royal Lahaina Resort, Kaanapali's original resort, has earned a reputation for graciously sharing Hawaii's Aloha Spirit and assisting valued guests in creating life-long memories. E Komo Mai. Welcome. Visit http://www.royallahaina.com to book. Customers may park in the parking lot in front of check in counters. Directions to said parking lot? Yes, please park in available parking space across from terminals. Customer may leave their vehicle for unlimited amount of time at $10 per day. Yes, there is a pay machine located in the parking lot. Yes, they are able to pay by credit card only via the machine. At least 30-45 minutes prior to departure as there is no TSA. There is a 24 hour security guard on the property. Yes, the Kapalua airport has rental car options. You have a variety of rental car options including Enterprise, National, Alamo, Budget, Avis and Dollar. There is a JHM shuttle pickup and they are located about 2 miles away toward Lahaina.